In an effort to mobilize income generation through afforestation as part of the ongoing project for providing employment to the masses, 1,10,000 fruit bearing and ornamental saplings were distributed to 31 villages under Manipur’s Tengnoupal district bordering Myanmar, Assam Rifles sources said on Saturday. 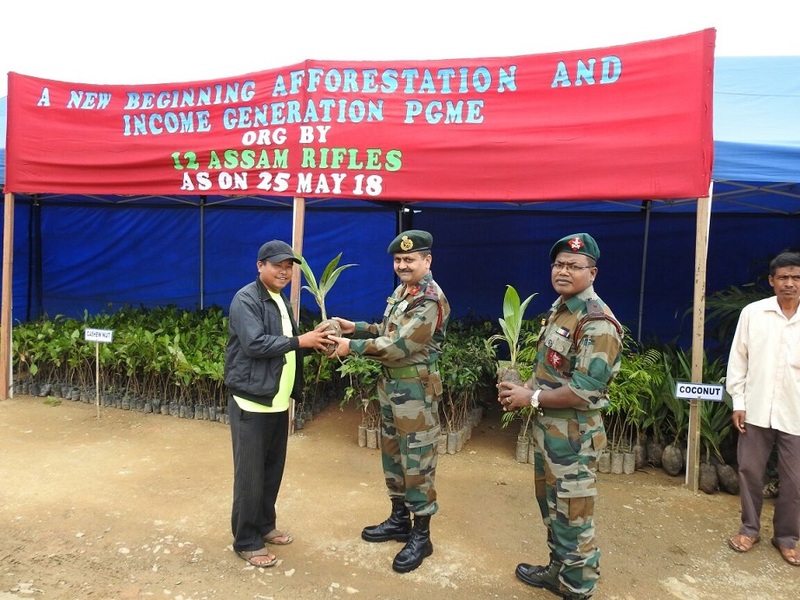 The innovative enterprise of Assam Rifles is an outcome of growing concern for deforestation and loss of natural habitat for millions of local flora and fauna, leading to climate change, stated a Assam Rifles (South) press release issued on Imphal. The said fruit bearing and ornamental saplings were distributed to the villages by Brig A S Chauhan, Commander 26 Sector Assam Rifles, Dr L Jeeceelee, Divisional Forest Officer of Tengnoupal along with representatives of the State Horticulture Department in a public programme held at Tengnoupal, a picturesque hill station turned district headquarters, about 70 km south of Imphal along Imphal-Moreh highway on Friday, the release stated. A total of 91 villagers including 31 village chiefs attended in the sapling distribution event. Speaking on the occasion, Brig A S Chauhan reportedly assured everyone that Assam Rifles as ‘Friends of the North East People’ and will continue to be for the people and with the people. The fruit bearing saplings which were distributed were of cashew nut, litchi, coconut, orange, lemon, banana, rubber, beetal nut, beetal leaf and yongchak. In addition to these, ornamental saplings of different varieties were also distributed. A detailed plan of the developing cluster based plantation/farm pockets has been prepared in consultation with forest officials, based on the favourable climate and terrain conditions. The villagers applauded the untiring and noble effort in addressing hardships faced by the local populace, as also the social issues looking forward to generate income from these plants for a better future, they took an oath to protect and grow them, according to the release. In the two earlier meetings held with all the concerned village chiefs in the month of April 2018, detailed interaction and awareness programme was conducted wherein method of plantation and precautions to be taken were also explained with the help of Forest and Horticulture Department. It may be mentioned that the State Forest and Horticulture Minister Th Shyamkumar Singh-led officials also visited Indo-Myanmar border areas under Tengnoupal district on Friday to oversee the prospects of cultivating fruit bearing trees in the area.